* The product images are for reference only. How and Where to Buy Spiriva? Our Canadian International Pharmacy dispenses brand and generic medications from Canada and other countries around the world at amazing prices. Please call our Customer Service at 1866-485-7979 for more information or check out our FAQ. Are there Alternative Names for the Brand and Generic Spiriva? The brand name Spiriva Caps and Device comes from Canada and Turkey manufactured by Boehringer Ingelheim. 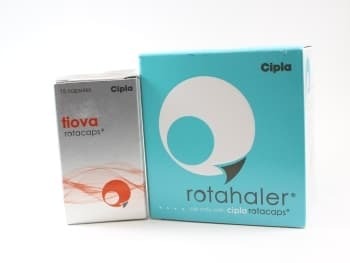 The generic (Tiotropium) comes from India also called Tiova with Rotahaler manufactured by Cipla. What Dosages and Forms is Spiriva available in? The brand name Spiriva is available in 18mcg/30 capsules per pack and the generic Tiotropium is available in 18mcg/15 capsules per pack. What is Spiriva Caps and Device used for? Spiriva Caps and Device (Tiotropium) is a bronchodilator that is used to control and prevent the symptoms of COPD. This medication also reduces the risk of flare-ups and worsening of COPD symptoms. Tiotropium belongs to a class of drugs known as anticholinergics. This medication works by relaxing the muscles around the airways so they can open up and you can breathe easily. Spiriva should be used regularly to be effective. It does not work right away so it should not be used to relieve sudden breathing problems. For sudden shortness of breath or wheezing, use your quick-relief inhaler such as albuterol. What are the Possible Side Effects of Spiriva Caps and Device? Are there any Precautions and Drug interactions for Spiriva Caps and Device? You should not use Spiriva if you are allergic to Tiotropium or Ipratropium. Before you start taking this medication, talk to your doctor about your medical history and about all the medications you take including OTC and herbal medications. It is unknown whether Spiriva will harm an unborn baby. Inform your doctor if you are pregnant or plan to become pregnant. It is unknown whether Tiotropium inhalation passes into breast milk or if it could harm a nursing baby. Tiotropium may make you dizzy or may cause blurred vision. You should not drive or do any activity that requires you to be alert. Limit alcoholic beverages. There may be an interaction between Spiriva and other medications such as Atropine, oxybutynin, vesicare, deltasone, nasonex, Qvar, etc. Spiriva Capsules should be stored at room temperature away for light and moisture. The capsules should be kept in the blister package until you are ready to use it. You should not store the capsules in the device. Once you open a blister package, it should be used right away.